It’s just before three o’clock Saturday afternoon, and the lobby of the Santa Barbara Athletic Club is mostly empty. Members have wrapped up their workouts and spin classes for the day. The little action is at the bar, where three guys quietly sip beer and watch a college football game. But from the club’s two white squash courts come the sounds of squeaking sneakers and chatty laughter as a dozen low-income Latino kids take turns rallying with each other. 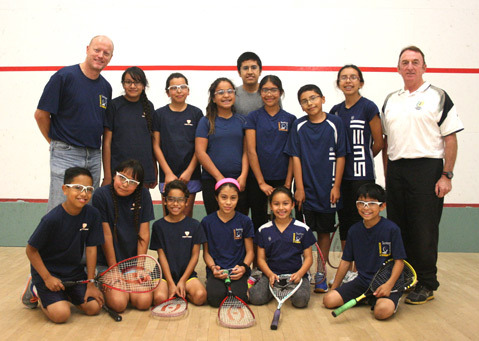 They’re all members of the Santa Barbara School of Squash (SBSOS), a unique, 9-year-old nonprofit that tutors disadvantaged South Coast youth while coaching them in a niche sport that may one day help them get into college. David Quintero is a senior at San Marcos High School. He’s been with the program seven years, and next week he’s visiting Bates College, a private Maine university where the squash coach wants him for the team. After that, he’s checking out the University of Connecticut. “Yeah, I’m really excited,” he said with a big nod and grin. Quintero explained SBSOS played no small part in getting his grades to where they are now, and it has allowed him to travel for tournaments, which introduced him to people and places he’d otherwise never experience. “It’s helped me a lot,” he said. Right now the Santa Barbara program ​— ​under the umbrella of the National Urban Squash + Education Association and its 20 locations across the country ​— ​serves 33 students from 15 different schools around the South Coast. Each of them lives below the poverty line. Participants are required to complete 100 hours of academics, 100 hours of squash, and 15 hours of community service every year, while 30 volunteer tutors ​— ​ranging from former college professors to high school students ​— ​monitor their grades every week and provide extra help as needed. In addition to its home at the Santa Barbara Athletic Club, which donates court time during slow hours, SBSOS operates from the Louise Lowry Davis Center and the Santa Barbara YMCA. Every so often, the kids go on field trips to places such as the Museum of Natural History or a soccer game in Ventura. Parents pay an annual fee of just $25. Between drills on Saturday, Franklin Elementary School student Monica Paredez sits on a bench with her feet dangling and twirls her racket in her hands. She’s wearing the same eye protection and navy shirt sported by the rest of the kids. Paredez, 9, talks about how SBSOS’s tutors have improved her reading and writing and how she and her teammates have “lots of fun” every time they get together. No one else at Franklin plays squash, she said, but now that they’ve heard her talk about it so much, they want to try. Familiar to relatively few West Coasters, and then usually as just a cousin of sorts to racquetball, squash is a much bigger deal on the East Coast and in other countries, especially Egypt and England. Merith Velasquez, a 15-year-old Laguna Blanca student with braces and dreams of becoming an engineer, said she’s excited to see how the sport is played in other parts of the country when she starts touring colleges. Graham is a former squash pro who reached #30 in the world rankings and #1 in the U.S. during his 14-year career. He worked at the Athletic Club as its racquet sports director and then its general manager before taking on a full-time leadership role at SBSOS, where ​— ​in addition to his duties of shuttling students from school and lending his expertise to their practice ​— ​he hustles for grant money and works to get the word out about the program’s success. Graham noted that one of his graduating seniors was accepted to UC Berkeley and that he had two national squash champions in 2013 and one voted an All American in 2014.